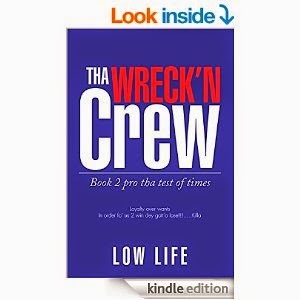 Today we are interviewing author Low Life (Calvin E. Jones) about his urban fiction book That Wreck'n Crew. I am a 28 year old black male in prison, 20 do 15, on #10. Started in 2009, finished 2014. Why do you write? Is it to share a message? Or is it to have emotional release? Or both? To share a message and emotional release. What do you hope readers will get from reading your book? That it is a choice to live in a situation or change it. What do you plan to accomplish with your writing during the next ten years? I hope to some day build a building where all kids can come play sports and other games instead of being on the streets, have a place where they can just come talk to someone. Anything else you’d like potential readers to know about your book? My book is about 9 young men who did not have a family, the bonded and became a family, and remain loyal to each other. Family is not always blood. Loyalty over wants.